Last week Apple unveiled its new iPhone with the latest innovations in communication technology. 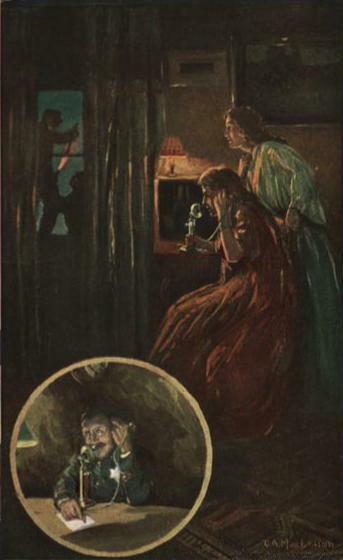 Its release came 130 years after Isabella Alden first mentioned the telephone in the plot of one of her novels. As convenient and indispensable as phones have become in our modern age, the same could be said of telephones in Isabella’s time. 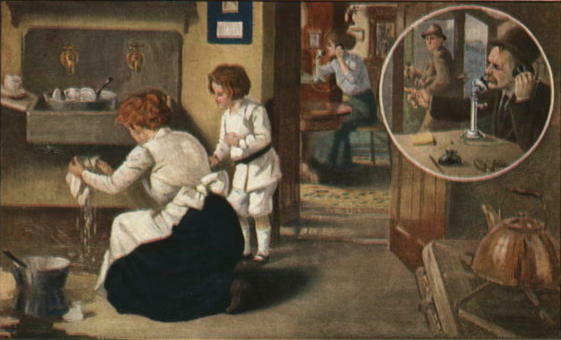 In the late 1800s and early 1900s, telephones changed the way Americans lived. 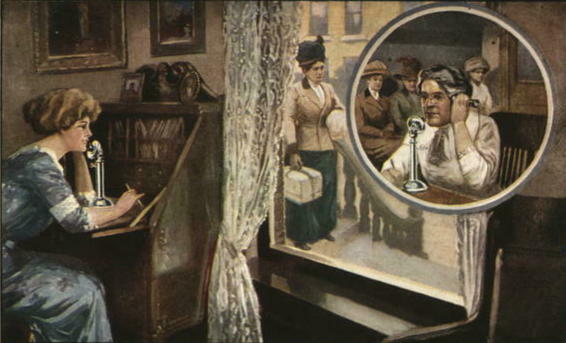 Isabella was 35 years old when Alexander Graham Bell patented his version of the telephone in 1876; but that first model had very limited capabilities. Although the early Bell telephones certainly transmitted sound, they only worked between two locations that were hard-wired to each other. 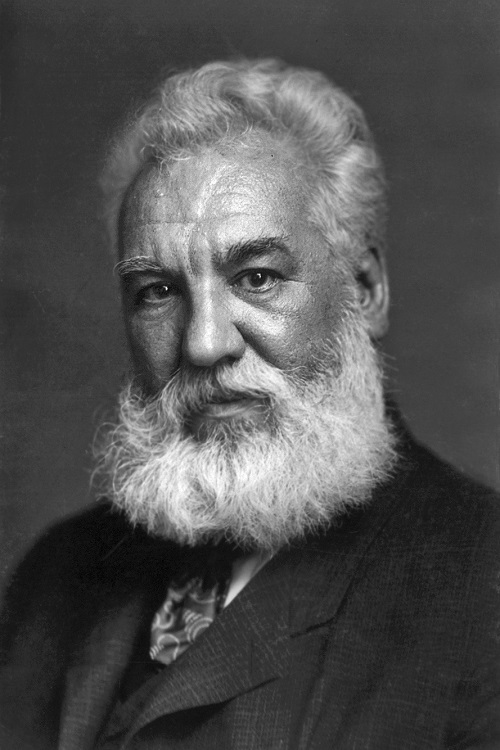 Then, in 1878, a man named George Coy invented the telephone exchange and immediately turned the telephone into a much more practical invention. 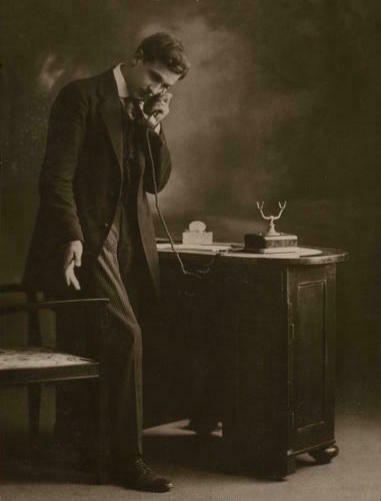 Instead of telephone lines being strung between two locations as Bell had envisioned, Coy’s exchanges linked any number of telephones to a single point: a switchboard. 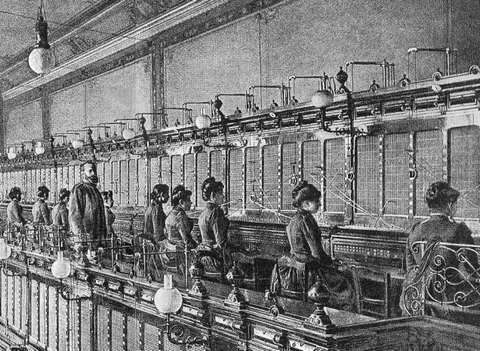 An 1890 illustration of women working a switchboard at a telephone exchange. 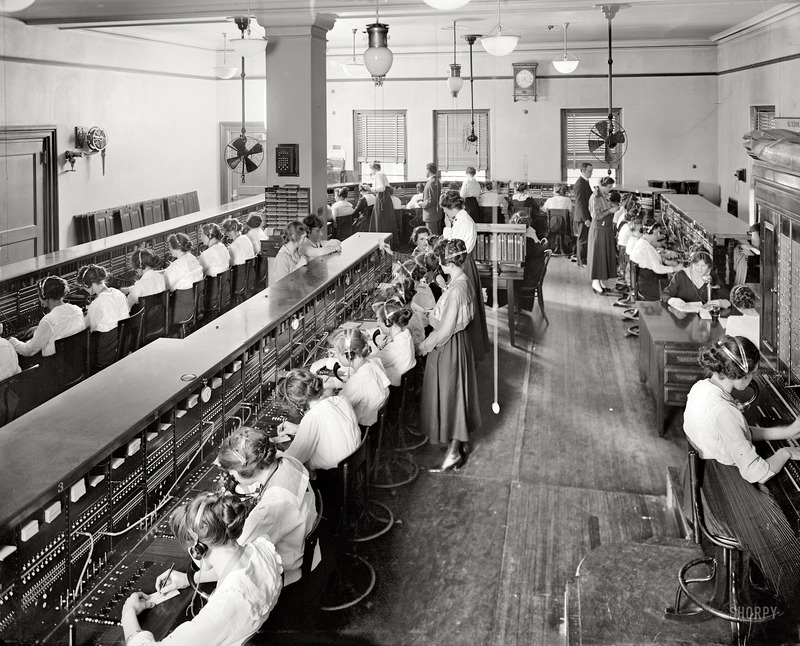 At the exchange, legions of trained switchboard operators used a series of cords and sliding keys to connect and reroute incoming calls to other telephones linked to the exchange. Thanks to those exchanges, telephone line construction exploded with growth over the next few years. 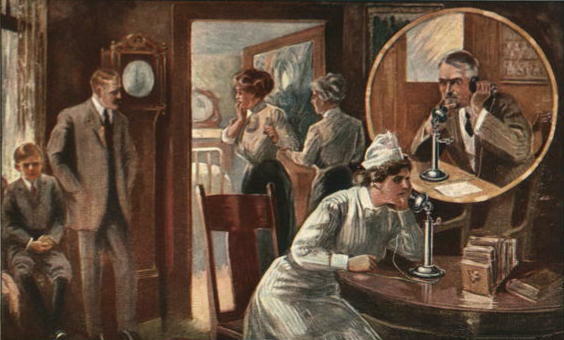 By 1880, there were 47,900 telephones across America. 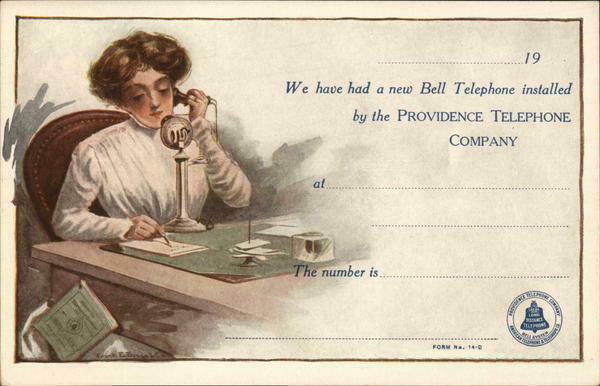 By 1881, telephone service between Boston and Providence was established. 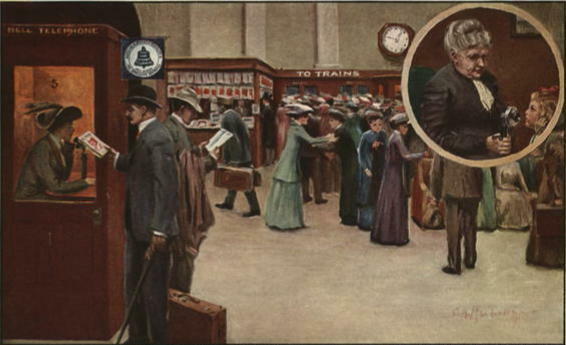 By 1892, a telephone line had been constructed between New York and Chicago; and two years later New York and Boston were connected. 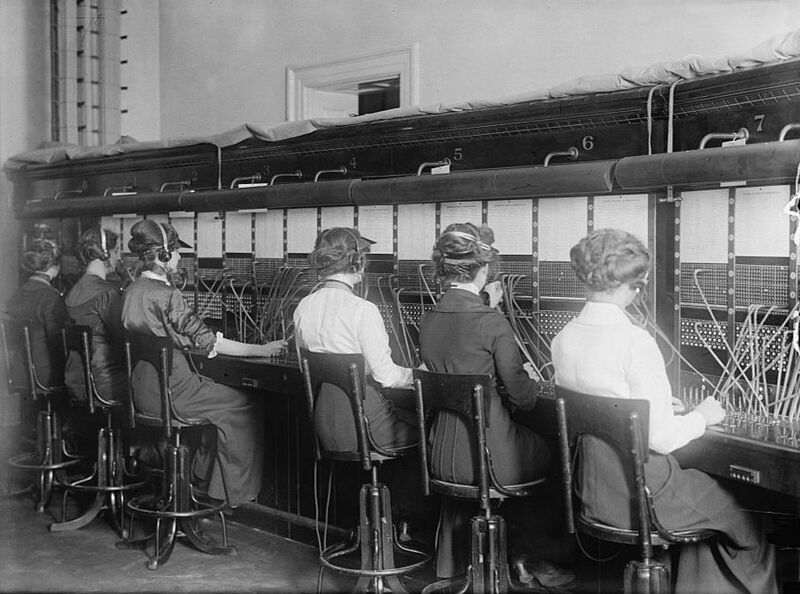 Switchboard operators at the Chesapeake and Potomac Telephone Company near Washington, D.C.
Another benefit of those exchanges: jobs. 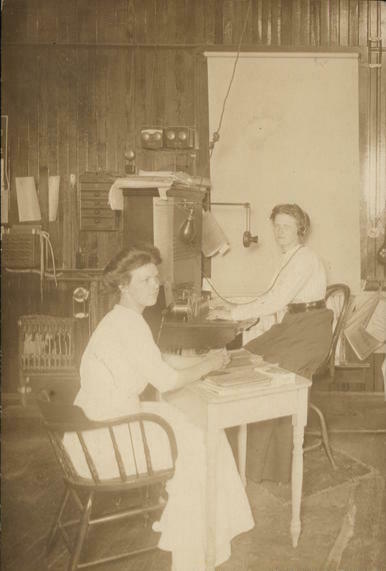 As telephone service expanded, more and more trained switchboard operators were needed to connect calls; and the majority of the operators hired were women. 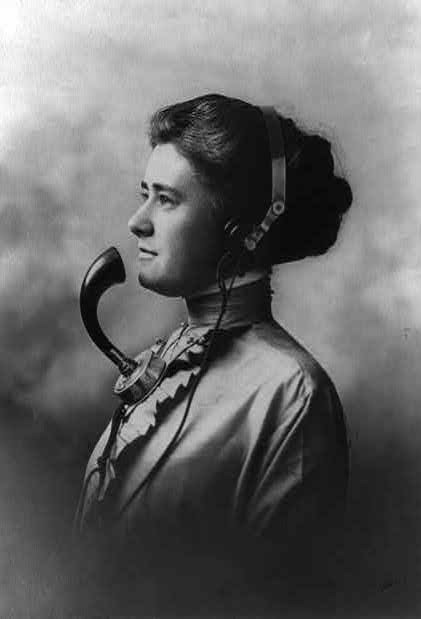 A 1911 photograph of a switchboard telephone operator. … a bright, pretty girl, young, and quite alone here. She lives in a dreary boarding-house, and used to have some of the most desolate evenings which could be imagined. Fortunately, not all switchboard operators lived and worked under such conditions. While the majority of switchboard jobs required working for a Bell Telephone Company, there were other positions available. For example, some large businesses that required multiple telephone extensions were equipped with their own exchanges and hired operators to run them. 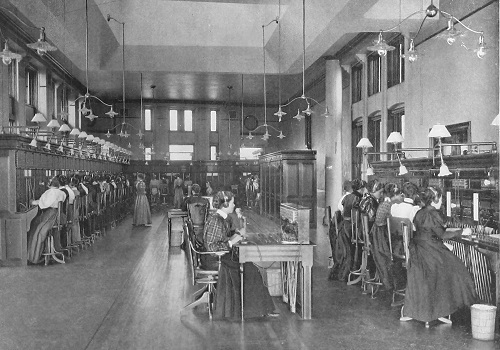 Switchboard operators in an office, about 1910. 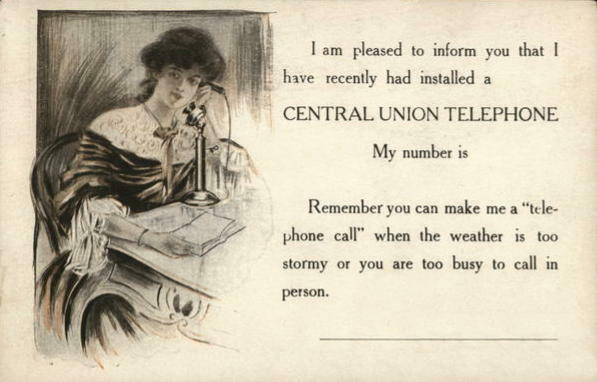 In fact, businesses were the foremost users of the telephone in the late 1890s. 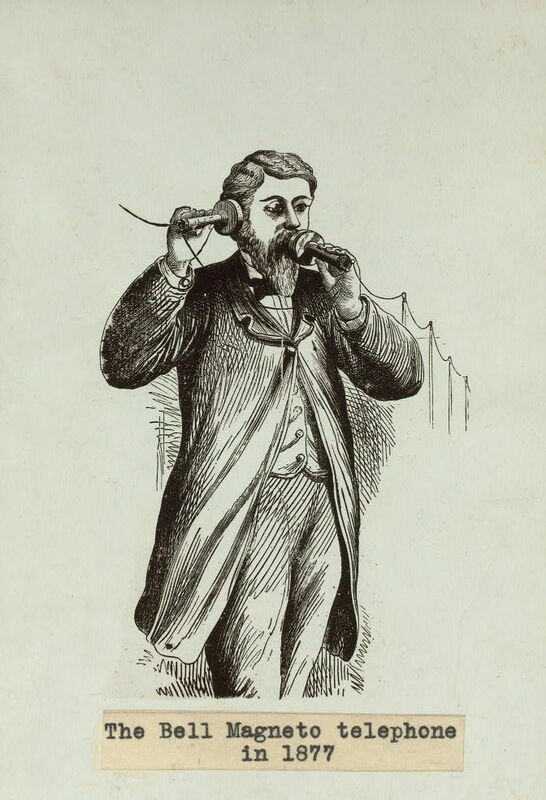 That’s because, in general, phones were too expensive for individual homeowners to install and maintain; but Mr. Mackenzie, the wealthy businessman in Isabella’s novel Wanted, could afford to have a telephone in his home. 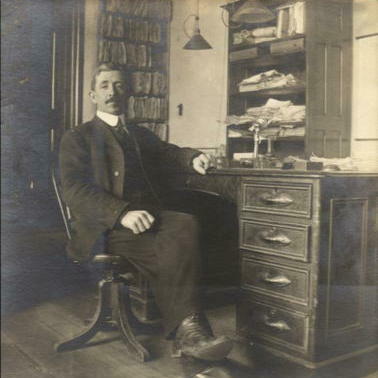 … administered with his own hand the medicine ordered. Even after the doctor had made light of fears and gone his way, the father sat with his finger on Lilian’s small wrist and counted the beats skillfully and anxiously. After witnessing his tenderness for his daughter, Rebecca begins to change her opinion about Mr. Mackenzie. Elsie is getting to be such a simpleton that I am afraid she would run home if I should let her know he was coming; and as for him, he is developing such idiotic qualities in connection with her, that I feel by no means certain he would not get up a telephone message or something of the sort to call him immediately to the office, if he should know before the dinner bell rang that Elsie was in the house. But by the time the 20th Century dawned, the demographics and cost of telephone usage changed dramatically. 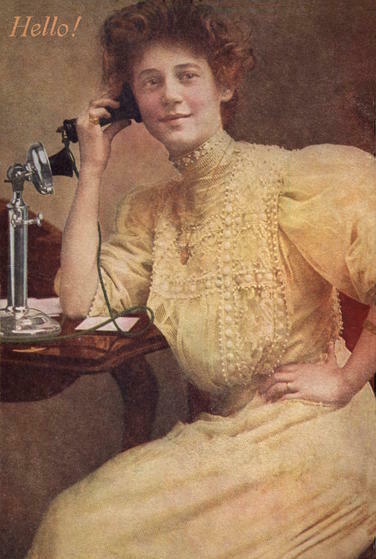 Telephone companies had connected most major cities and strung sufficient telephone lines across the country to bring costs down, and phone company executives began to set their sights on a new goal: providing service to residential customers. At first, advertising to consumers stressed the obvious: keep in touch with friends and family. 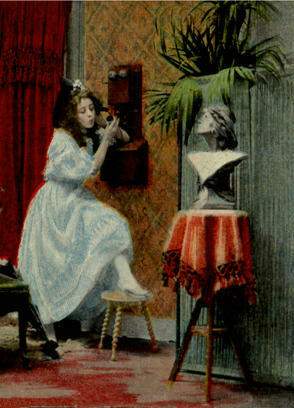 Blowing kisses over the phone, 1908. 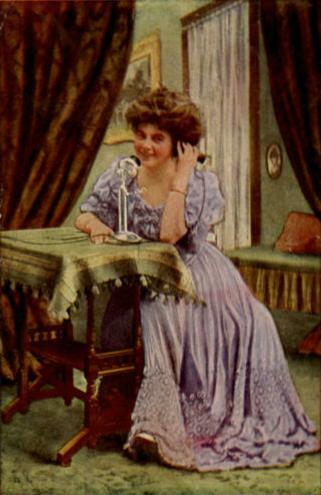 Then, in 1910 the Bell Telephone Companies developed several strong marketing campaigns that offered different reasons why every home should have a telephone. 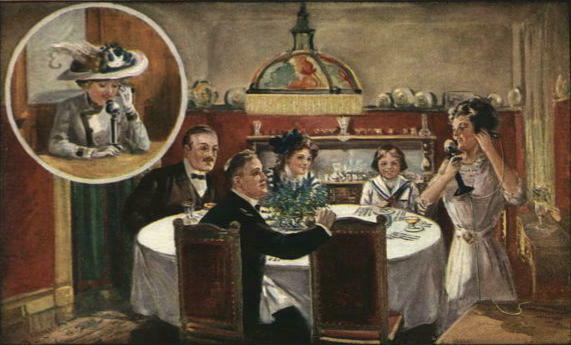 One campaign was directed specifically at the lady of the house. … and quickly helps arrange replacements when servants fail you. The ad campaigns were extremely successful. People began to think of telephones as an essential tool for the home, instead of a mere convenience. Soon, telephone companies across the country were installing residential telephones at an astonishing pace. 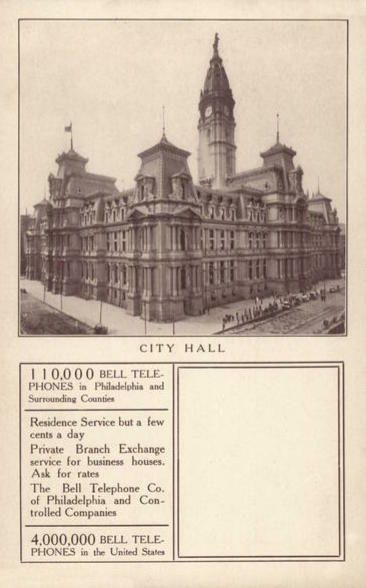 This Bell Companies business card for the Philadelphia area cites the number of installations locally and nationally. The blank space was filled in by an installation or service subcontractor with his own contact information. We’ll make the dinner light and easy to manage; just a steak and some baked potatoes and canned corn. Did you say there was no corn? Oh, I remember, you told me yesterday, didn’t you? Well, just phone for it. Call up Streator’s, they are always prompt; tell them they must be. And we’ll just have sliced tomatoes with lettuce for salad; all easy things to manage, you see. As for dessert, make it cake and fruit—strawberries, or peaches, it doesn’t matter which. Why, dear me, that dinner will almost get itself, won’t it? It’s amazing to think that Isabella Alden saw the development of one of the greatest inventions of the Twentieth Century. 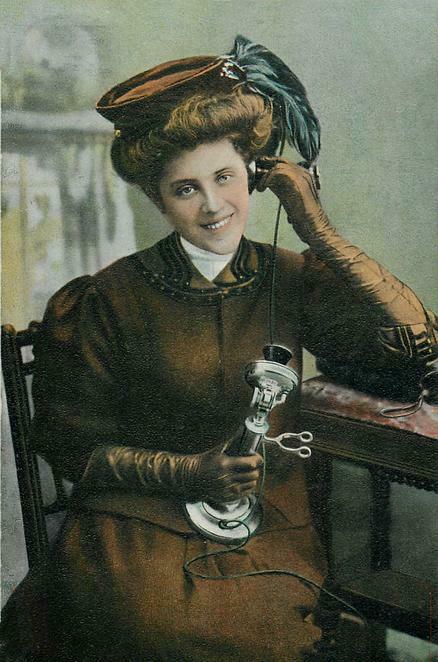 In her time the telephone was innovative and exciting. It opened new avenues of jobs for women and changed the way people interacted with each other; and Isabella reflected those changes in her novels and stories that we still read and appreciate today.